oil update Archives - Kase and Company, Inc.
December WTI broke the recent and crucial $79.1 swing low when prices fell to a $78.14 intraday low on Monday. This was the 1.00 projection for the two largest waves down from $106.81 (Wave A) and $103.66 (Wave A’/C). 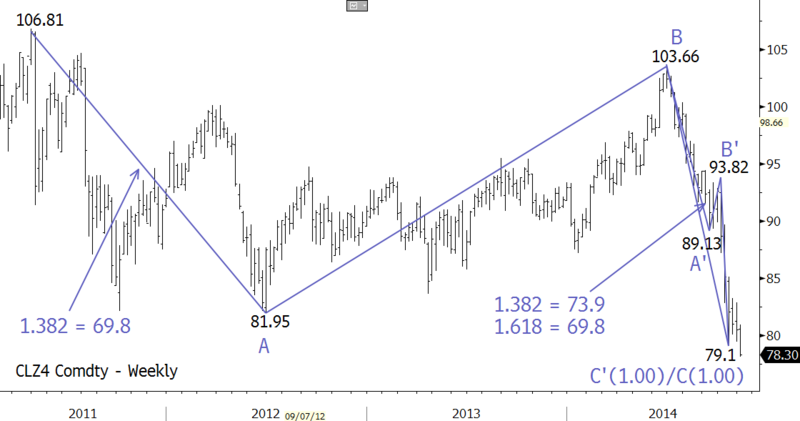 WTI is now poised for at least $73.9 and possibly $69.8, which are the next targets for these waves. Look for near-term resistance at $79.8, $83.0, and $84.8. For more information about this call, the importance of these targets (and others), and the technical factors driving prices lower, take a trial of Kase’s weekly energy forecasts.